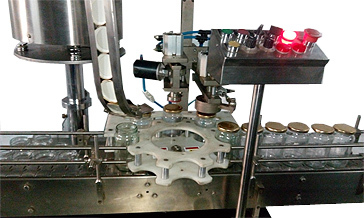 Automatic capping machine for lug caps, twist off caps is used for locking sealing of lug or twist off caps on glass jars for jam, sauce, pickle, chutney bottles, containers etc. The machine comes in single or multiple capping head, linear as well as rotary models. special capping head is designed with proper torque according to cap samples to avoid damaging cap ribs, vibratory or continuous cap feeder feeds the cap to cap delivery chute, which is picked by jars one by one very smoothy without damaging or scratching the caps. star wheel moves the jar with loosely placed cap towards capping head, the cap is preset with required torque tighten the cap to desired level and avoid over tightening. the perfectly capped bottle moves out on conveyor for further operation like sterilizing or labeling, cartooning or packaging. 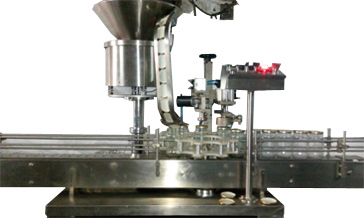 steam or gas flushing can be provided before capping on request we do provide with whole filling line from washing to filling capping labeling equipment for jam, sauces, chutneys, pickles, pastes, adhesives, honey, creams, cosmetic products etc.